Mention Genesee & Wyoming, Inc. to the average railfan and they will happily explain that it's a holding company owning a vast number of short lines in forty-one U.S. states, as well as Canada, Australia, the United Kingdom and Europe. However, there actually was a Genesee & Wyoming Railroad from which all the rest grew: a modest 15-mile short line in upstate New York whose main reason for existence was hauling salt. 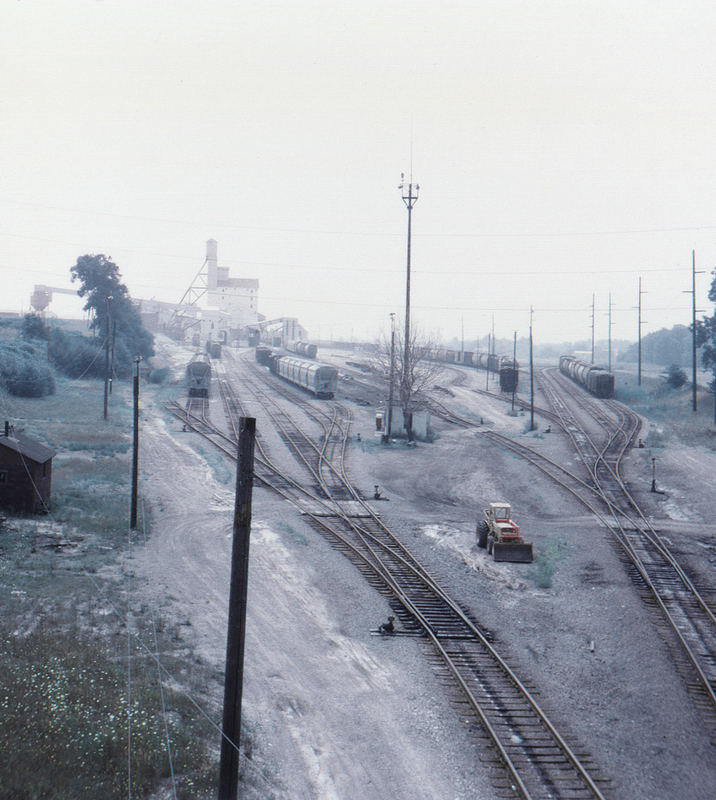 In 1970 it resembled a three-legged stool, with the salt mine at the center (near the small town of Retsof, New York), and connections with the Delaware, Lackawanna & Western at Griegsville Station, the Pennsylvania's Rochester Branch north of Piffard (abandoned by this time), and the Erie and New York Central at Caledonia. The G&W was merged into another G&W property, the Rochester & Southern, in 2003. (For a map of the far-flung G&W empire, see the April 2018 Trains). Here we see the massive Retsof Salt Mine with its associated Genesee & Wyoming Railroad trackage, looking south from the New York Highway 63 bridge. The track at the far right is the connection with the Lackawanna main line. In 1994 the mine, at that time the largest salt mine in the United States, collapsed. A new mine, the Hampton Corners Mine, was opened near Mount Morris on the former Lackawanna. This page posted 3/28/2018. Text and photo ©2018 Lamont Downs.